The Heinen laboratory is interested in the molecular mechanism of the human DNA mismatch repair pathway and in understanding why defects in this pathway are associated with the hereditary cancer predisposition disease Lynch syndrome. Cilia and flagella are microtubule-based organelles that have essential motile and sensory functions. The King lab studies the dynein molecular motors that are required to assemble and power these organelles using genetically and biochemically tractable model systems. Our lab focuses on localization and translation of RNA molecules in ribonucleoprotein complexes called RNA granules, which are affected in neurological disorders such as fragile X tremor ataxia syndrome. Our laboratory is interested in the relationship between iron metabolism and cancer. We examine the hypothesis that iron contributes to cancer using cell culture systems, animal models and patient databases, as well as through collaborative work with systems biologists. We investigate the mechanisms utilized by scaffolding proteins to create specificity of phosphorylation. Our work encompasses many domains including enzyme kinetics, live cell imaging, cellular physiology, and computation modeling. My expertise and research interests are in elucidating structure, dynamics and interactions of biological macromolecules using structural biology methods, including NMR spectroscopy and X-ray crystallography. The focus of my current research is on ubiquitin biology and the role ubiquitination plays in cancer development and gene silencing. The Schuyler lab utilizes computational modeling to study binding and allosteric signalling in order to elucidate complicated disease mechanisms and inform drug design. Current work includes the study of SOD1 mutations that cause ALS. Persisters are rare cell types in a bacterial population that can tolerate lethal doses of antibiotics that kill their genetically identical kin and can contribute to relapsing infections. The Mok lab is interested in investigating how bacteria respond to and survive treatment with antibiotics that target distinct cellular components under different growth niches. My work uses high temporal and spatial resolution fluorescence imaging methods to explore the dynamic behavior of molecules in living cells. Experimental results are integrated within the Virtual Cell mathematical modeling software environment to create three-dimensional computational models of a variety of different cellular events. The Weller lab studies the mechanisms of HSV DNA replication, encapsidation and viral assembly and explores novel antiviral strategies aimed at inhibiting these processes. We are also interested in how HSV manipulates host stress responses such as DNA repair and the protein quality control machinery. 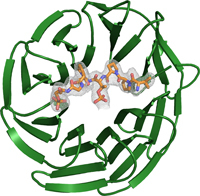 The research of the Hao group aims to determine the physical and chemical principles underlying the structure/function relationships in biomedically important proteins, with a focus on ubiquitin E3 ligases that are altered in cancer and spore germination proteins that can cause food spoilage and food-borne disease as well as anthrax. The Gryk lab focuses on solution NMR studies of biomolecular macromolecules, primarily proteins. A current emphasis is on software integration and data management for NMR data analyses - a project called CONNJUR. My research focuses on the pathogenic spirochetes Borrelia burgdorferi and Leptospira interrogans, the causative agents of Lyme disease and Leptospirosis, respectively. Our broad objective is to better understand the environmental signals, regulatory pathways and gene products required to maintain these unique bacteria within their enzootic and zoonotic life cycles and establish infection within the mammalian host. Our research focuses on protein assemblies involved in DNA damage tolerance pathways responsible for mutagenesis in eukaryotes, making use of cutting-edge structural biology methods to decipher their molecular mechanisms of action. Neuropeptides are used to control many functions including mood, appetite and water balance. We are interested in dietary and genetic factors that affect the ability of cells to produce these signaling molecules. Research in the Molecular Biology and Biophysics department focuses on understanding the proteins and pathways affected in human disease. From the structural biology of cancer drug targets to the mechanistic interplay between viruses and human cells, MBB labs study the basic molecular processes underlying human illnesses. âExtreme slow growth as alternative strategy to survive deep starvation in bacteria.â, Gray et al., Nat Commun. 2019 Feb 21;10(1):890. "Promises and Challenges for Checkpoint Inhibitors as Anti-Cancer Drugs"